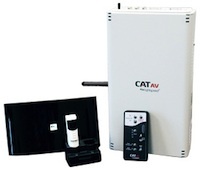 Lightspeed's CAT AV is a classroom audoo systemcoupled with a Cat-5 AV switch. LightSpeed Technologies, a company that specializes in educational audio equipment, has launched a classroom AV system that offers sound amplification, wireless microphone capabilities, and an AV switch that sends both audio and video signals over Cat-5 cables. The new system, Cat AV, uses an amplifier with a power of 16 watts per channel (two channels, totaling 32 watts), with four-band equalizer and two ISR ports. The wireless microphone system uses infrared technology and consists of one receiver and two microphones. Both microphones feature audio inputs and volume adjustment. To send audio and video signals over Cat-5 cable, the system employs an AV switch that includes two 15-pin VGA inputs, two composite video connectors, two 3.5 mm audio inputs, two RJ-45 outputs, and a 3.5 mm audio output with a corresponding volume knob. A wireless selector allows users to control system power, projector power, source selection, muting, and volume.